A frequent problem in OpenStreetMap is that someone dreams up a project that involves generating good routes for pedestrians, decides that OSM’s standard way of routing pedestrians along streets isn’t good enough, and proceeds to add every single pavement (or sidewalk, for our American friends) as a highway=footway – causing a headache for other mappers who now have to move three lines instead of one when they refine the road geometry, among other things. A very promising solution to this problem has been developed by Nathanel Lang in his Bachelor Thesis (at HfT Stuttgart) available in German here: https://github.com/Nathanael-L/pedro). He’s synthesizing footways on both sides of streets (unless the highway type or particular tags say otherwise), and then takes care to properly link them to the rest of the network – or drop them again if it is found that footways have already been mapped as separate geometries. Road crossings are also synthesized because it is assumed that smaller roads may be crossed by pedestrians anywhere. 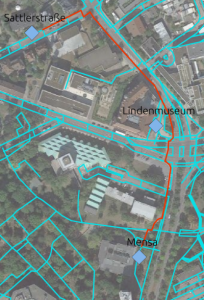 That way, he can generate a pedestrian-friendly routing graph to be used as the basis for routing – without actually adding lots of unnecessary extra geometries to OSM. The software that generates the routing graph is called “Pedro”, and available from GitHub at the URL given above. 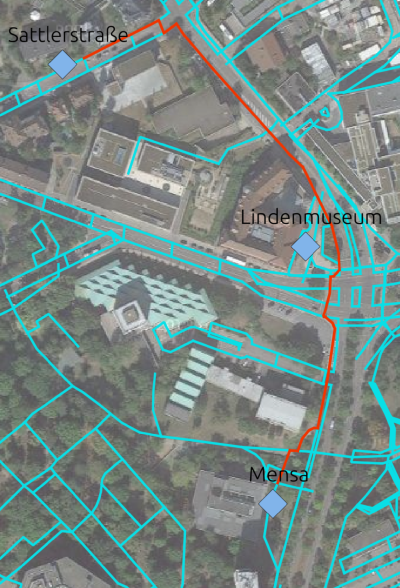 There are some open ends that might need attention before it can be used in a world-wide production environment, but already it is an excellent demonstration of the possible future of pedestrian routing with OSM.